With the winter months fast approaching, the weather will soon turn nasty. While we may worry most about protecting ourselves from bad weather, it is important to make sure the mess stays outside. Doormats help with foot traffic, but we often forget about our vehicles. Tires drive through the nastiest conditions all the time and track it into the garage. This makes the garage dirty, but it can also lead to the mess being tracked into the house too. Thankfully, they have garage floor mats, similar to doormats, for your tires. In this article, we will help you figure out what is the difference between garage floor mats and what is important. We also offer our recommendation of the 5 best garage floor mats for different purposes. Finally, we go through the different qualities in our buyer’s guide so you can make a reasoned choice. As will be a trend, do not confuse AutoFloorGuard, or AFG, for the parent company Marygrove Awnings. 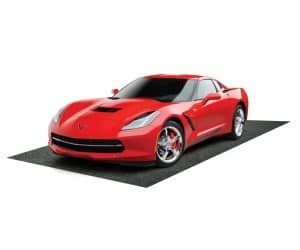 AFG is just a subsidiary brand, but it is still specialized exclusively in the portable garage floor mat market. On top of that, AFG goes the extra mile in so many different ways that they are easily our Editor’s Choice best garage floor mat. If you are looking for a portable floor mat, there are few better. For one, the containment edge on the AFG is the best that we saw. Made of non-absorbent foam, the edge is 1 ¼” tall making it the tallest edge that we reviewed. 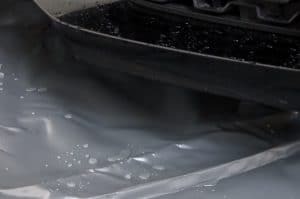 While the polyester is woven for strength, the vinyl coating prevents water from soaking through. The seams are watertight and heat-sealed to ensure that fabric does not mold. The seams converge to the AFG’s patented Stay-Put corners. This prevents the portable AFG floor mat from moving while in use. Even better, this is actually the least expensive product on our list. That should not be an indictment though as it is every bit as good as products twice its price. As for downsides, most are a trade-off more than actual flaws. For instance, the mat is especially good at keeping the mess contained. However, this means that you might have to clean the floor mat after every use to avoid a build up. If you do not, the mess can quickly turn into a contained puddle in your garage. This makes getting out of your vehicle that much more difficult. Another potential issue has to do with the type of floor mat the AFG is. As a portable floor mat, the AFG can technically move around a bit over time. Some floor mats use a special base layer to prevent sliding, but this can lead to more wear and tear on the upper layers. AFG considers that you will be cleaning the mat often enough that you will be repositioning it as part of maintenance. 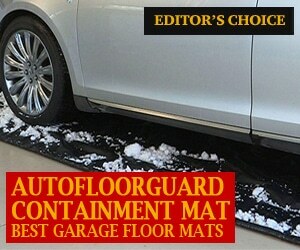 It really should not surprise anyone that the Armor All floor mat is ranked as our Editor’s Choice best garage floor mat. While Armor All may not specialize in garage floor mats, they do specialize in protective accessories of all kinds for vehicles of all types. 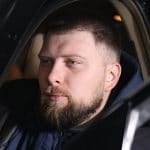 With a storied history and a reputation for solid products, this is probably the best option for the most people. Armor All saw what everyone else was doing and thought of taking a novel approach. Instead of covering the polyester fabric with PVC, let the fabric be the top layer. The waterproof PVC serves as the bottom layer, so the Armor All is still waterproof. This may be a minor difference, but it has some important benefits. First, this allows the Armor All to be the most comfortable floor mat by far. With the fabric layer on top and exposed, the Armor All feels similar to carpeting or thick artificial grass. 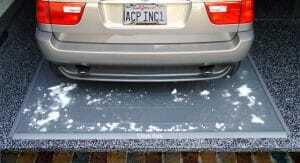 This also makes the Armor All floor mat non-slip for both you and the vehicle. Another great quality about the Armor All is that it does not suffer from being cut. Many other floor mats lose their seal if they are cut. Because it absorbs the mess, the Armor All can be cut to any shape or any size and still work just as well. Of course, as great as this design is for the moment, it does come with some familiar drawbacks. Namely, cleaning the Armor All floor mat is the most involved process on our list. Not only do you have to spray the floor mat like any other, but you also have to vacuum the top fabric. This makes cleaning the Armor All floor mat take significantly longer. Another issue with the Armor All is just part of the trade-off with a permanent floor mat. Basically, the Armor All does not have a containment edge. That said, this floor mat attempts solve that problem by absorbing the water and mess within the fabric. Of course, this then creates more instances of our first problem. Still, the comfort and absorption of the fabric does more than make up for a more regular cleaning cycle. Better Life Technology, or BLT, focuses explicitly on specialized flooring needs. While garage floor mats are one dimension of this, BLT also makes flooring for marine settings as well as printings. That said, BLT bucks the trend most manufacturers are going and sticks to a classic approach. 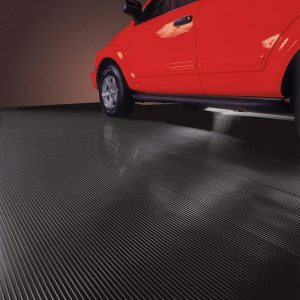 As such, BLT is by far the best PVC garage floor mat that we came across. Because the BLT does not use polyester, the measurement is a bit different. Rather than ounces per square inch, this floor mat is measured in millimeters. In this regard, it comes in at an impressive 55 mm–which is 5 mm thicker than most of their competitors. That said, this does only apply to other floor mats made only of PVC. The fact that the BLT is made of PVC might be a problem, but the permanent flooring type combined with the better than average thickness makes up for that. Another solid benefit is that PVC can better handle extra-hot tires from fast driving on hot days. That said, this arrangement does have some consequences. First, the permanent type makes this a more difficult floor mat to clean. This is made even more difficult due to the ribbed construction. Basically, the ribs are great at trapping water and messes, but they trap it too well. This makes cleaning the BLT floor mat a much more time-consuming task. The fact that it is a permanent type of floor mat only adds to this issue. As a permanent floor mat, the BLT does not have raised edges. This means that cleaning at the edges will be even more difficult. Otherwise, you will also have to clean the garage floor too. TruContain is a brand of Garage Flooring LLC., so you do not have to worry about its reputation. As the name suggests this brand specializes exclusively in garage floor mats. It is worth noting that Garage Flooring LLC and TruContain are less than a decade old. 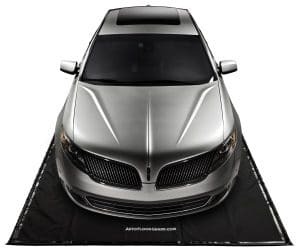 That said, this still seemed to be the best portable garage floor mat that we came across. TruContain takes a tried and true formula with the portable floor mat at a solid value. The seams are heat-welded to ensure that they remain waterproof. One of the interesting differences with the TruContain is that the seams are on the bottom. This is great for most purposes so long as the floor beneath does not get wet. While not the tallest, the TruContain does still have a 1 ⅛” containment edge which is pretty good. On top of that, this floor mat also has the thickest fabric layer at 23 oz/sq. in. Altogether, this may be the most durable floor mat on our list, but it is not without its flaws. The biggest problem with the TruContain floor mat is that it will not always lay flat. It seems a persistent issue where the weight of the car pushes the mat, causing it to bunch up. 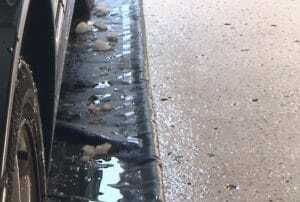 Not only does this negate the containment edge, it also allows puddles to form right where you get out. Some people have taken to adhering the TruContain floor mat to their garage floor. The bunching issue is bad enough on its own, but it also has a tendency to make the TruContain harder to clean too. Basically, the bunching will force you to clean the mat before and after every use. Otherwise, you will almost certainly overflow the containment edges at some point. Auto Care Products Inc has actually been around for almost 30 years. While the company does not specialize in garage floor mats exclusively, most of their products cater to protective accessories. Combined, this seems to be ideal, but the Clean Park floor mat has some issues. Still, it is easily the best garage floor mat for motorcycle or ATV that we found. In fact, one of the best things about the Clean Park lineup is that they have something for everyone. Whether you need to cover your entire garage or just want an oil mat, the Clean Park floor mats have you covered. With over 8 different sizes to choose from, the Clean Park fits any space. This is one of the few floor mats we saw which only uses PVC, but uses 2 different types. 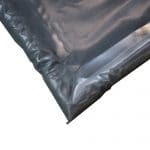 First, the Clean Park has PVC fabric which is then covered by a 50 mm thick PVC coating. This makes the Clean Park easy to clean as well as waterproof. At least, that is the idea behind the floor mat. The edges of the Clean Park are a bit of a give and take. On one hand, the edges are designed to snap onto the mat. This makes setting up the mat easy and allows some moderate customization. The problem lies with the fact that the edges are not waterproof, though they are decent. Another issue with the edges is that they move and shift the way the mat of portable floor mats often do. Aside from opening leaks for water, this can also lead to the edges cracking or breaking. Coincidentally, the Clean Park floor mat also sells replacement edges. When it comes to garage floor mats, there are not that many different types to choose from. 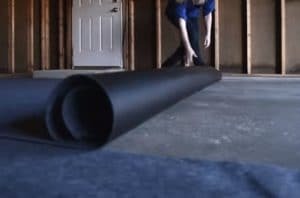 Really, there is only 1 “type” of garage floor mat: the roll. However, this single type can be either permanent or portable. Which you choose likely depends on how you intend to use the vehicle. Permanent – This is the type of garage floor mat that could conceivably be removed but is meant to be treated as the floor. This kind of mat will usually be larger, thicker, and heavier than the portable floor mats. In fact, this type of floor mat will often require a much more significant investment of time, energy, and money. Of course, you would be willing to invest more in a permanent floor mat, because it will last twice as long as the portable floor mats. Granted, you do not have the luxury of taking your floor mat with you should you go elsewhere or move. Though the floor mat will increase the value of the garage, so it is not a complete loss should you move. The big benefit of the permanent floor mat is that it can handle far more stressful forces than a portable floor mat. Both types of floor mats will perform well when dealing with a car and likely most standard trucks or SUVs too. But larger, custom vehicles can present issues for portable floor mats, especially if hydraulics or pneumatics are involved. 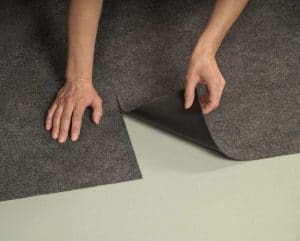 Portability – This is the most common type of floor mat and likely what people mean when they say “garage floor mat.” This type of floor mat can be rolled up, taken to another location, and unrolled. Altogether, this type of may requires far less investment of time and energy and is also often less expensive. This type of floor mat is generally not as strong or durable as a permanent floor mat. For most people, this is not an issue, but if your vehicle is exceptionally heavy you may have issues. 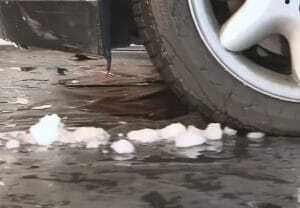 Also, if you have been driving faster than normal for extended periods of time, heat from the tires can be a problem. Still, a portable floor mat is also easier to clean since you can take it somewhere else to clean. With a permanent garage floor mat, you have to clean it like any other floor. With a portable one, you can take the mat with its mess elsewhere to clean it. This is especially useful if you have to clean up or other debris off the mat. The material used for a garage floor mat will play a big role in determining how well it holds up over time. Pretty much all floor mats use some type of plastic, but different types provide different physical materials. Basically, some types of plastic are more resistant to compression and heat–the 2 most common types of forces garage mats deal with. Vinyl – While many garage floor mats contain polyester, all of them contain vinyl. 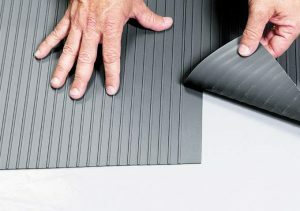 This is largely because vinyl is a cheaper material that provides excellent waterproofing. 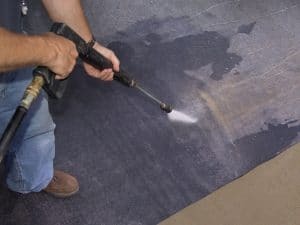 Keep in mind, the primary purpose of a floor mat will usually be to keep it dry. Depending on where you live, you might have to worry about other types of debris, but only the desert does not have to worry about the rain. Other qualities that make vinyl a great choice are its low reactivity to the chemicals commonly used in a garage. It is also not reactive with too many petroleum products, alcohols, or salts. This pretty much covers the overwhelming majority of chemicals your vehicle uses. Vinyl is also easy to wash, allowing you to collect the mess and dispose of it properly. It is worth noting that vinyl is not actually that strong of a material on its own. A large enough thickness can provide functional strength, but vinyl itself is fairly weak. This means that a thinner floor mat made entirely of vinyl will not be that durable. That is a large part of why they started to use both vinyl and polyester together. Polyester – The original floor mats were made entirely of vinyl–usually polyvinyl chloride, or PVC. Unfortunately, PVC on its own is not that strong. You needed more PVC than was reasonable to get a decades-long product. This meant that most garage floor mats were understood to be fairly portable. 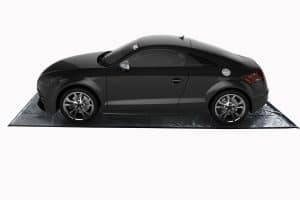 However, companies soon figured out that you could use other plastics with PVC to get a floor mat that offered the protections of PVC with better strength. In the end, the strongest, most cost-effective solution was to include polyester in the construction of the floor mat. Polyester is a significantly stronger material than PVC and can be made in just as many different ways. By coating the polyester with PVC, you get the best of both worlds with no real difference in price. It is important to note that non-woven polyester will give you a better seal than woven, but woven is stronger. This is the most important part of the construction on floor mats. 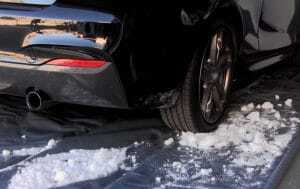 In fact, the seams will often determine how long the floor mat will last. 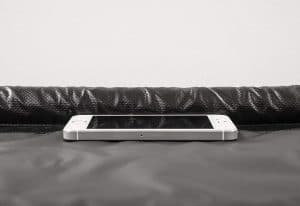 The vinyl covers and polyester fabrics are less likely to rip compared to a seam. There are a couple ways that manufacturers use to avoid this issue. The most common solution to this problem is by heat-welding the seams. This makes it much less likely the seam will split. That said, the quality of the heat-welding will impact this too. On top of that, water can seep into the fabric liner of many floor mats if the seams are not properly sealed. Another novel solution to the problem is changing where the seams are located. Some manufacturers place the seams underneath the floor mat. Others will place them at various points, but the idea is to prevent them from breaking. While there might only be a couple of different types of garage floor mats, there are plenty of different situations to use them. Depending on what you need, one-floor mat might be better than another. Basically, there is not a single floor mat best for everyone. That said, we still recommend the Armor All for its solid performance both during bad weather and not. If you are willing to keep this floor mat clean, it offers the comfort of a carpet with the durability of any other on the market. With a non-slip bottom and waterproof base, the Armor All can do everything anyone else can and more. On the other hand, if you are looking for a less expensive option, the AFG is a solid choice. As a standard portable floor mat, it has figured out how to keep the mat flat. It also has the tallest containment edge, providing more time between cleanings.